Ships tomorrow if you order in the next 24 hours 3 minutes. 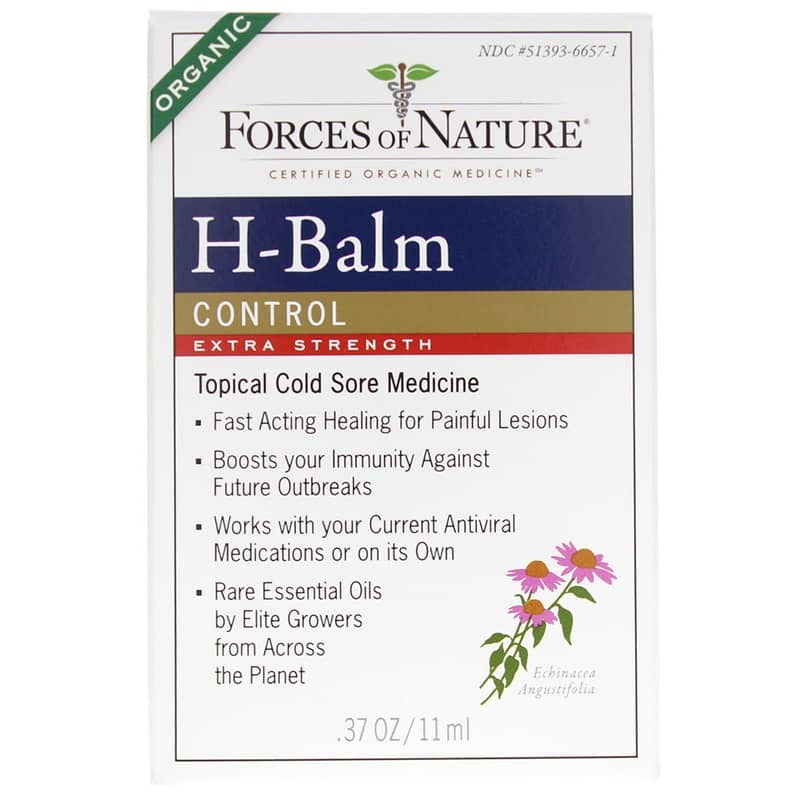 H-Balm Control Extra Strength from Forces of Nature is a topical homeopathic product for clearing up cold sores while promoting healthy skin. This is the world's first ever certified organic, FDA registered medicine for cold sores and related outbreaks and it works fast. Recommended by dermatologists and medical doctors, it is to be applied directly to cold sores or the affected area and can be used with antiviral cold sore medicine or on its own. H-Balm features Forces of Nature's dual modality approach combining certified organic homeopathic medicines which activate immune parameters to fight outbreaks, with medicinal plant extracts which penetrate deep into cell membranes. This dual modality approach expands and supports the action of the homeopathics, thereby delivering two actions in one. 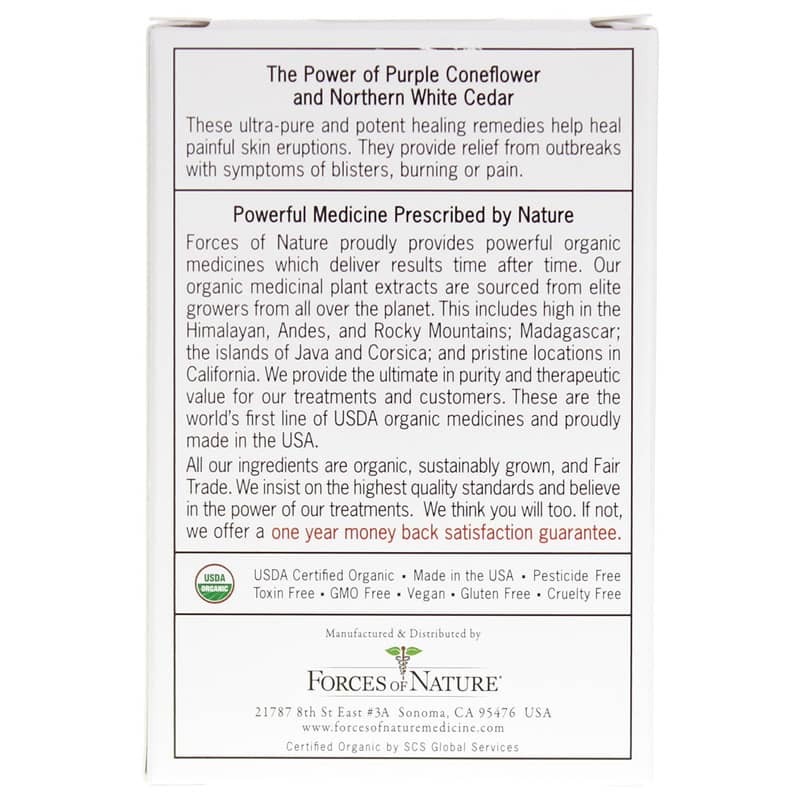 Forces of Nature's cold sore medicines are manufactured and formulated by their naturopathic doctor, Dr. McKinnon, who has over 20 years clinical experience. This is her personal formula, and contains over 15 different medicinal plant extracts, which exhibit a high level of anti-microbial activity. These extracts are obtained from the purest sources from all across the globe. H-Balm is powerful and helpful for emergency care. Apply during an outbreak or when you feel one coming on. 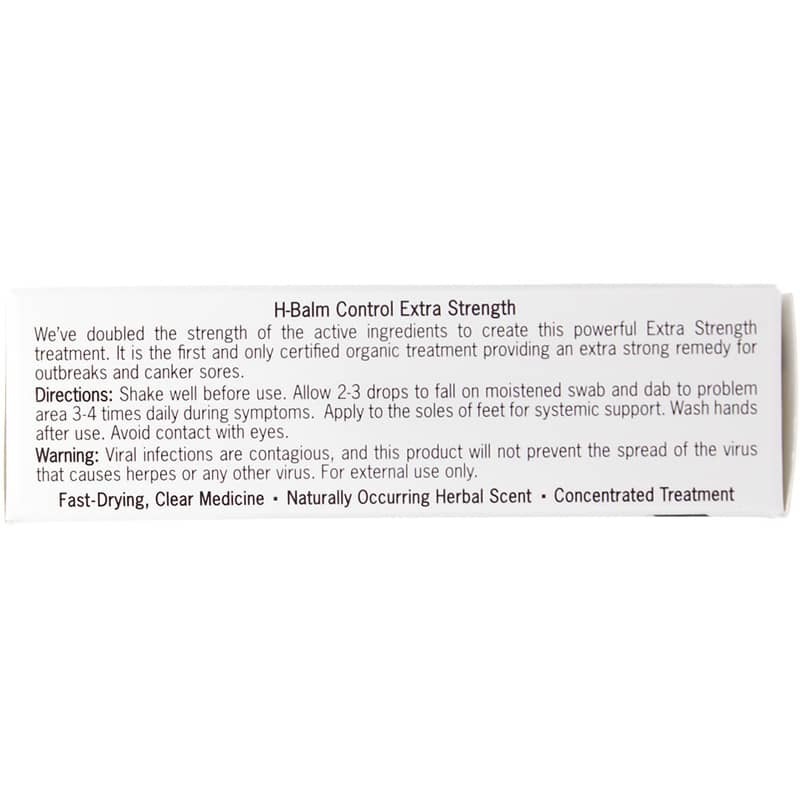 For suppressive therapy, application of H-Balm Daily is recommended. 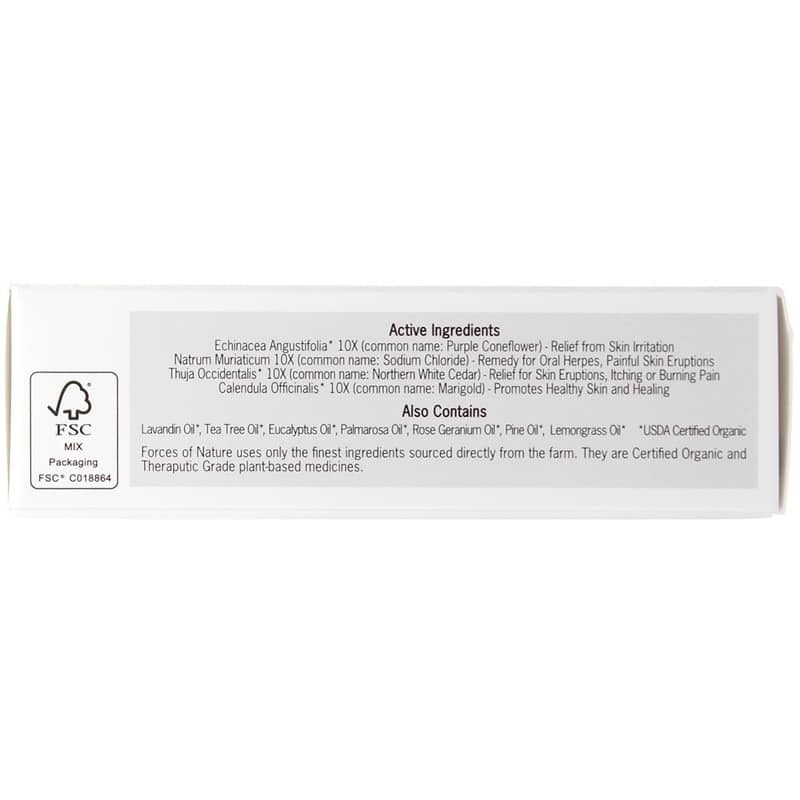 Also Contains: Lavandin Oil*, Tea Tree Oil*, Eucalyptus Oil*, Palmarosa Oil*, Rose Geranium Oil*, Pine Oil*, Lemongrass Oil*. Contains NO: GMOs, pesticides, gluten, toxins. Vegan and cruelty free. USDA Certified Organic. Apply 2-3 drops on moistened swab and dab to problem area 2-3 times daily as suppressive therapy. Apply to the soles of feet daily for systemic support. Wash hands after use. Avoid contact with eyes. Viral infections are contagious, and this product will not prevent the spread of the virus that causes herpes or any other virus. If skin symptoms worsen discontinue use and consult a health care professional. Some individuals may be sensitive to essential oils. Begin with a small drop to determine if the product causes any increased redness or irritation and discontinue use if it irritates your skin. For external use only. If accidental ingestion more than several drops, and adverse reaction occurs, get medical help or contact a Poison Control Center. Do not apply to the eyes. If you are pregnant or breast-feeding, ask a health professional before use. Not for use on children under age of 3. Keep all medicines out of the reach of children. Stop use and consult a doctor if condition worsens, or consult a doctor if symptoms show no improvement after 7 days.